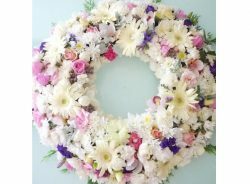 Send Funeral Wreaths to commemorate and honor a wonderful life lived. 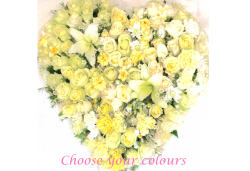 Say goodbye with Fresh funeral flower wreath at funeral services. Our team specializes in funeral wreaths up to 1m wide, written/print condolence messages in all languages particularly written in Chinese Mandarin. All hours deliveries to all funeral services same day or early morning can be arranged. 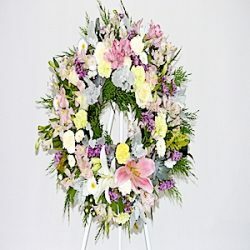 We have wreath tripod stands as additional gift purchase for displaying your gift at funeral services across Melbourne whether it is at Le Pine, Tobin Brothers, White Lady, Springvale Botanical Garden, we delivery to all areas, to churches, funeral homes, funeral services in all suburbs in Melbourne, Victoria.